Ahhh, there's nothing like "natural flesh" in the morning! My ad class spent this morning drawing "roughs" - hand-drawn sketches that will appear as full-page ads in their magazines later this semester. To enhance the assignment, CreComm student Greg Berg brought in his awesome vintage collection of "Laurentian" pencil crayons (not a typo, the company has since changed its name to Laurentien) and produced the "natural flesh" pencil crayon, above, otherwise known as the politically incorrect version of "Peach" or "Blush Pink." Crayola stopped calling its crayon "Flesh" in 1962 to reflect the very real possibility that flesh actually comes in a variety of colors, though that didn't stop the company from waiting four more years to change "Indian Red" to "Chestnut." Wow. I'm not sure when Laurentien stopped producing "Flesh" pencil crayons - I couldn't find a reference online - but I do recall these pencil crayons and their iconic design and illustration of a cabin on a snowy hillside being a staple of every kid's back-to-school supplies. Now if they'd only get rid of "Pasty, White Norwegian," I'd be set. Negative skin tone overtones have no place in my pencil case. I vaguely remember seeing that color in the mid-70s at least, if not later. Too funny! I especially love that it was called "Natural Flesh". I foresee a new PR assignment soon about how to create racially sensitive pencil crayons. Wow, I had no idea that I would get a "Laurentian" pencil crayon history lesson today. That's fascinating, actually. I've decided that I am boycotting any further drafting assignments in advertising, in favour of not supporting racist colouring methods. 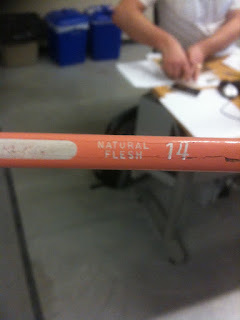 I, personally, am looking forward to the "unnatural flesh" pencil crayon. Hmmm...could be the pox! http://www.factmonster.com/ipka/A0872797.html This website says the 'Indian Red' pencil was not renamed until 1999. thats 37 years after the 1962 renaming of the 'natural flesh' pencil!